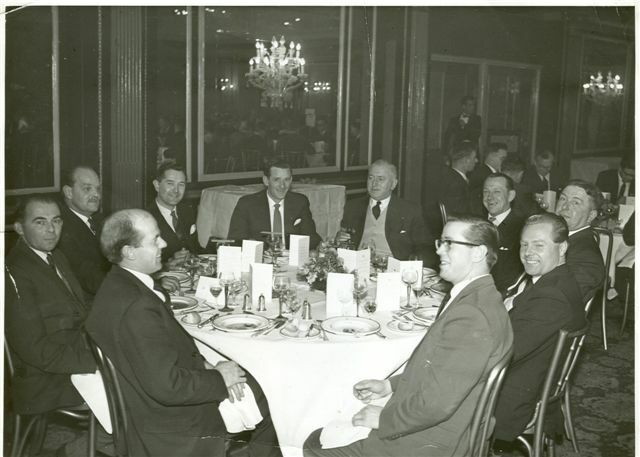 This is a picture of my father who worked at The Royal Garage Invergordon, at a dinner representing W.M. Munro where he started as a mechanic. He then moved over to Farm Sales for William Munro, concentrating on Massey Ferguson equipment sales. My father George Coghill is in the centre of this picture (the young man at twelve o'clock!). The date of this picture is a guess. Willie Munro's were the Nuffield agents. I don't recall them being Massy Ferguson. McKay's Dingwall were Massy agents as far back as I can remember. I started in the Tain garage (Tain Motors) in 1966 not too long before old (Dad) - by which all the old hands will remember him - died. I still remember him in the shiny metalic green Humber Super Snipe. Waistcoat, pocket watch and chain and the cigar, and the grunt Oh! Oh! A good old boss he was to. Munroes were Massey Harris agents before Massey Harris and Fergusson merged - Mackays were Fergusson agents. Is that John Munro, sitting on the front right ? I remember going with my dad Bert Mackenzie who worked at Ord Farm on an old Nuffield to collect his new one. This one had a cab which was a luxury at that time. It was either 1959 or 1960 and definitely a Nuffield dealership as all the tractors in the garage were Nuffields. I think the SAI were next door.